Marine brigade, for a total of as many as 23,000 additional combat and support troops. 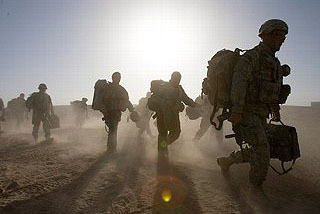 The first additional combat brigade probably would arrive in Afghanistan next March, the officials said, with the other three following at roughly three-month intervals, meaning that all the additional U.S. troops probably wouldn’t be deployed until the end of next year. Army brigades number 3,500 to 5,000 soldiers; a Marine brigade has about 8,000 troops. But apparently Team Obama wants some more time to work on their PR campaign before they announce this publicly. “This is not going to be an easy sell, especially with the fight over health care and the (Democratic) party’s losses” of the governors’ mansions in New Jersey and Virginia last week, according to one unnamed source. I’ll buy that.